The Williams College recycling guide lays out which items can be recycled, and where on campus to bring various items. Please note that college recycling has a different system than Williamstown recycling, which can be found here. 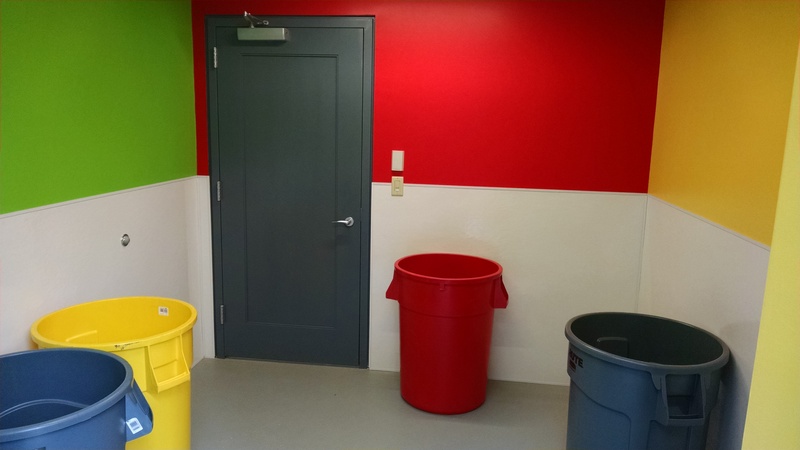 Color-coded Waste Room in Horn Hall. Williams collects paper, newspaper, cardboard, plastic, glass and metal containers, and batteries for recycling. Recycling from residence hall common rooms go into the central Waste Rooms (often labeled Trash Rooms), which are typically in basements. Recycling containers for paper, glass, plastic, and metal are available in public areas across campus. Individual offices have paper recycling containers, as do classrooms. What is recyclable and non-recyclable? Please see our comprehensive recycling guide for more information. Our campus Recycling Team pick up the recyclables once a week and take them to certain locations around campus until our recycling hauler, T.A.M., hauls it to their recycling center in Pownal, VT. At their facility, the recyclables are separated. From there, aluminum and scrap metal goes to Weistman’s in Albany, NY. Paper and cardboard is taken to Westrock in Syracuse, NY. The final destination of glass and plastic varies. What initiatives has the College pursued? Williams has put together several ad-hoc working groups to investigate how much the College sends to recycling facilities each year. Starting early in academic year 2011, Williams has instituted a waste measurement system. In previous years, we collected data related to volumes of recyclables but not overall trash volumes. We have been working with our trash and recycling service providers to develop an online reporting system. We now have enough information for some of our waste streams that we are developing baselines that we can use to set ambitious goals. The Zilkha Center also organizes regular waste audits to determine what trash and recycling is being thrown where, how much of it there is, and if it is being separated correctly.